Do make sure that any tips and suggestions work as you expect them to in your own particular circumstances. After years of training, lecturing and consulting on the use of spreadsheets I've finally got round to writing a book covering the areas that I consider essential to creating effective and reliable spreadsheets. Hopefully the following interview, organised by the original publisher FSN, will provide full details of the book's contents and help you decide whether you, or your colleagues, will find it useful. The print version was called "Maximising the impact of accounting and financial spreadsheets" but it is now available as a PDF for just £12.99 including VAT. Not another book on Excel? Surely there are more than enough already? This book is aimed specifically at those working with accounting and financial data and it doesn't attempt to be a complete guide to every aspect of Excel. Instead, it is intended to provide a practical guide to using Excel to achieve better results more quickly and more efficiently. In addition, it covers a range of design strategies and spreadsheet techniques to make your spreadsheets more robust and minimise the considerable risk of material error. It also shows how some of the enhancements to Excel 2007 and 2013 can make a major contribution to the impact your reports make and dramatically reduce the manual effort that goes into them. Which versions of Excel does the book cover? Most of the features and techniques covered are relevant to most versions of Excel - certainly from Excel 2003 onwards and, where different, instructions are provided for Excel 2003 as well as Excel 2007 and 2010. 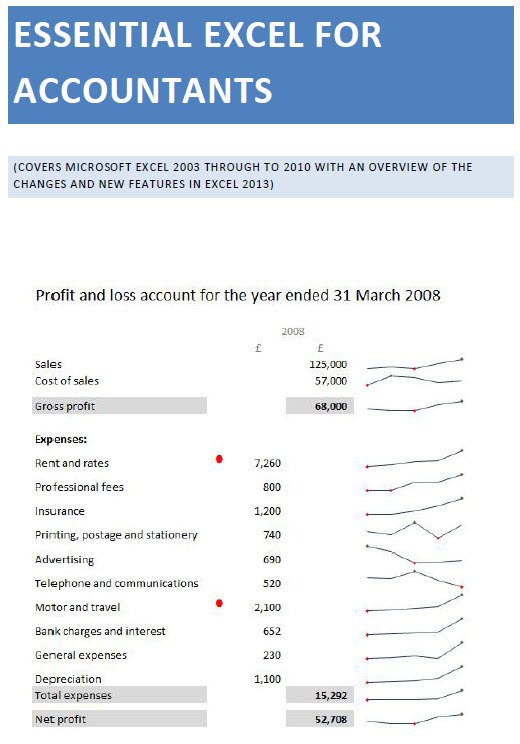 The PDF includes an overview of the changes in Excel 2013. A book on Excel? Surely the only way of learning about an application like Excel is through hands-on training and experience? I think that's absolutely right for basic competence, but when you start to look at how to apply techniques in practice then lectures and books can be very effective in showing what can be done and prompting you to examine new, and hopefully better, ways of working with spreadsheets. The book also features easy to follow, step-by-step instructions together with hundreds of screen images to help you follow the implementation of the techniques in your own spreadsheets. Only 200 pages? For £12.99 I'd have expected something I could barely lift. Good point. I remember many years ago, when I was discussing writing another book with someone, querying why anyone would pay nearly £30 for 200 pages when they could buy a 650 page book for a similar amount. They pointed out that the real value in a more specialist book is the amount of time readers save by not having to identify and avoid the 450 pages that aren't relevant to them. Well, I've been called worse. It reminds me of that picture of a large fish about to swallow a shoal of small fish, oblivious to the even larger fish right behind him. Gurus have their own gurus. There are experts who know a lot more than I do about particular areas of Excel. Perhaps I might be a 'niche guru'. For the last 25 years or so I have worked with accountants and other finance professionals to help them make better, safer use of Excel. As well as specific consultancy and troubleshooting assignments, I've run hands-on training courses and lectures for thousands of accountants, finance professionals and their colleagues and clients. In more recent years I have contributed articles on Excel and other IT subjects to a range of websites aimed at this marketplace including, of course, FSN. I hope that all this experience has given me significant insight into how Excel is used and the main areas that people find useful and that will provide immediate, practical benefits. So what sort of level of Excel expertise is the book aimed at? When I first started lecturing on Excel to rooms full of accountants my main worry was that they would all know everything I was about to tell them already. Certainly, there are a great many accountants out there with excellent Excel skills. However, my years of lecturing and training have shown me that there are also many thousands of accountants and finance professionals, together with their colleagues and employees, who are competent in their use of Excel but could improve their spreadsheets, and save a great deal of time, by implementing the techniques covered in the book. I would hope that even the more expert Excel users might find enough hints and tips and different approaches to using Excel to make reading the book worthwhile. The book goes from basic skills such as an introduction to the consideration of good spreadsheet design and efficient use of Excel formulae and functions, through getting at the data in your accounting systems to automating spreadsheets and making them more interactive using controls and Visual Basic macros. All the techniques are brought together in the final chapters where we examine the use of a range of features, including PivotTables and the latest graphical features, to create reliable, interactive and powerful Excel reports. As an accountant yourself, should you really be promoting the use of a software product that has been implicated in so many embarrassing and costly mistakes? Yes, Excel is fundamentally unstructured and error-prone and there are many situations where it is used badly and inappropriately. However, there are many applications where Excel is a safe and efficient solution and its amazing flexibility enables it to solve a whole range of problems very cost-effectively. The book is intended to help you determine when not to use Excel as well as to appreciate and minimise the risks associated with Excel spreadsheets. I'm glad you mentioned that, you spend the first three chapters just going over the basics. However fantastic your Excel reports look, they are only going to make an impact - well the right sort of impact anyway - if the reports' users feel they can rely on their accuracy. It might not seem as glamorous as multi-coloured bubble charts and in-cell column charts, but a sound knowledge of the basics is a vital foundation for creating efficient, reliable spreadsheets. It might also be useful to recommend to colleagues with less Excel expertise. Of course, later chapters do cover more obvious 'impact' topics such as macros, charting and dashboards including the controversial topic of whether charts incorporating pictures of lemons are a good idea or not.